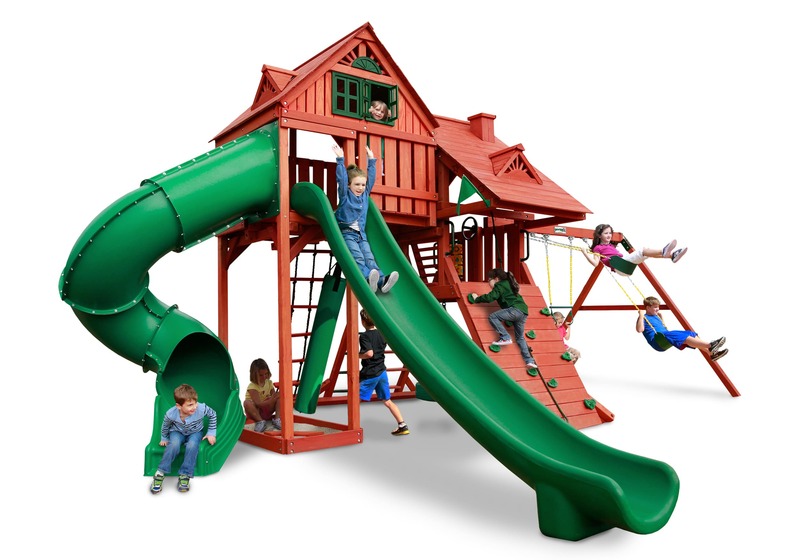 The Sun Palace Deluxe by Gorilla Playsets is designed to allow kids to play on three different levels. They can play in the sandbox area, twirl on the 360° Turbo Tire Swing™, or practice their boxing skills on the punching bag on the ground level. On the second level, they can steer towards adventure with the Steering Wheel or play a game of tic-tac-toe! And if that’s not enough, they can choose to slide down one of the TWO slides – our gigantic 14′ Super Scoop Slide™ or our twisty Radical Ride 7′ Tube Slide™! The play deck is protected with a tongue and groove wood roof. Let the fun begin, order yours today!